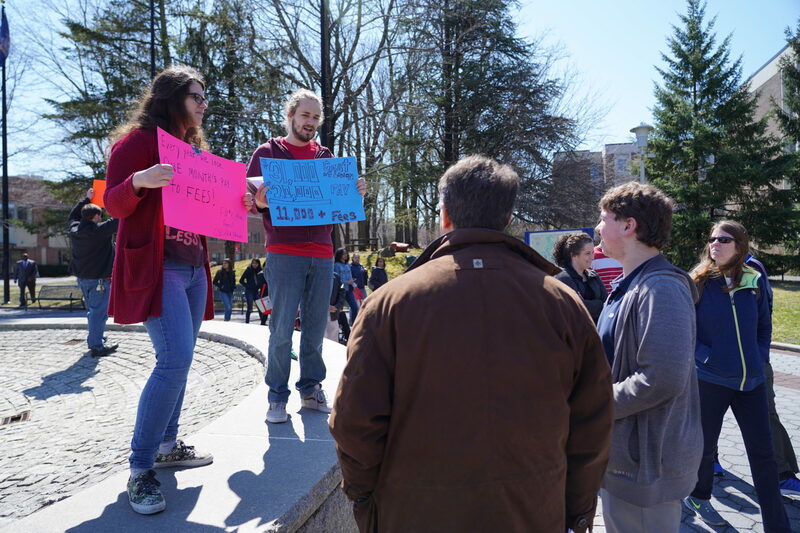 At this year’s Admitted Students Day, prospective students and their parents passing by the Academic Mall fountain got an unexpected glimpse of some on-campus activism. The so-called broad-based fees include a health and counseling fee, technology fee, transportation fee and other fees that are charged in addition to student tuition, according to the university’s website. Starting from fall 2019 semester, the fees for graduate students have been proposed to increase by $90.25 per semester, bringing the total comprehensive fees to $1,557.50 per year. Some parents and prospective students attending the Admitted Students Day program looked on and some stopped to ask questions. Stilianos Papazahariou from the High School for Math, Science and Engineering at the City College of New York, who is planning on majoring in biochemistry at Stony Brook University, said the protest was an unexpected scene during his tour around campus. Chief steward of the Graduate Student Employees Union (GSEU) at Stony Brook, Caroline Propersi-Grossman, said she is paid around $20,000 per year. Executive Vice President James Searle mentioned similar figures during his speech at the SUNY Board of Trustees meeting on March 20. According to the Massachusetts Institute of Technology living wage calculator, the required annual income before taxes for one adult living in Suffolk County is $32,301. Propersi-Grossman said the increase impacts international students more because of the visa restrictions they have on off-campus employment. Arthur Smith and his son Joshua Smith of Newfield High School in Middle Country Central District, stopped to talked to the graduate students and said they were sympathetic to the students’ situation. Joshua Smith said that although seeing the protest won’t weigh on his decision of where to go to college, he’s glad he got to see the students protesting. “If the people teaching me have to focus that much on their own economic stability, they won’t have as much ability to teach me,” Joshua Smith said. Propersi-Grossman said as part of a public employee union, they can’t go on strike under New York State law. But she said they can hold a sign up to bring awareness to “an unfair labor practice” and they’re coming back to protest again on May 1, International Workers’ Day. Stony Brook University Media Relations and the Bursar’s Office couldn’t be reached for comment in time for publication.